Print option is divided into 5 categories. General, Bill, Order List, Kitchen and Invoice. 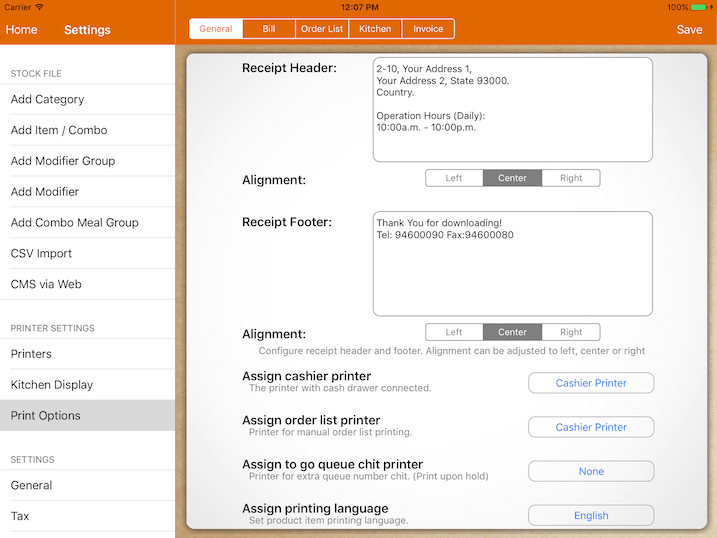 Specify the printer for cash register Print Order List button. If a to go bill is hold, an extra queue number chit will be printed. Leaving it at None will not print any queue number chit. You would want to configure this to your cashier printer. Each terminal can be configured to have their own printer. Do set to the specific printing language if you are printing non english character. If your printing language is not listed in it, please contact us. Configure the date format that will be printed on receipt. Import your logo from your album. Resize accordingly as save. Logo is printed on top/bottom of customer receipt. If turned on, customer receipt will include zero price item as well. If turned on, each line item price will be printed below the order. Example: "1 @ 3.00"
Hide the receipt number printed in customer receipt. 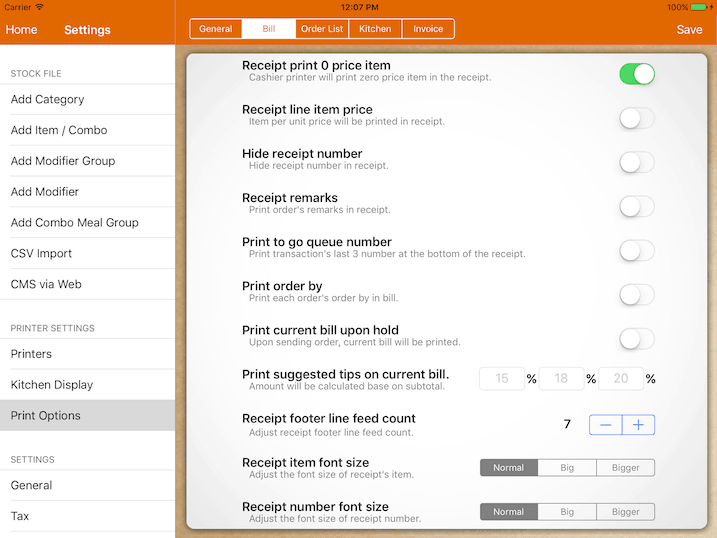 Enable printing order's remarks in customer receipt. Enable printing of transaction's last 3 number at the bottom of the receipt. This is printed on the final receipt and current bill. Do not be confused by this and queue chit printer. Assigning queue chit printer will print an extra docket with queue number on it upon hold, however this would rather append the queue number to the receipt upon checkout. Print 3 suggestions of tips at the bottom of a current bill. Adjust accordingly to make sure the printer cuts at the right position. Adjust the font size of receipt number for customer receipt. Adjusts the font size of table number for customer receipt. 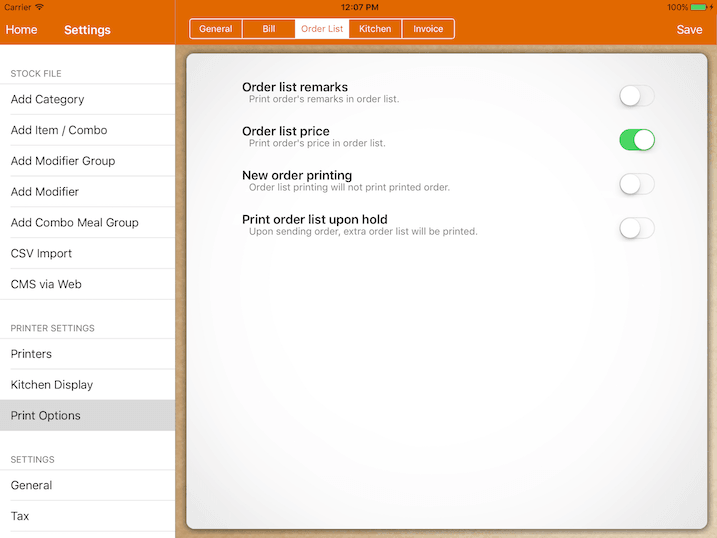 Enable printing order's remarks in order list. Each time you click on print order list manually, system will only print orders that have not been printed. If turned on, kitchen docket will print price beside each order. The default line feed between each order is 3 lines. Turn on to reduce to 1 line. To differentiate void order from additional/new orders, you can turn on inverse black/white printing. For TSP-100, it will print strikethrough orders. By default, voiding item or bill will print a void kitchen docket. Turn on to disable it. 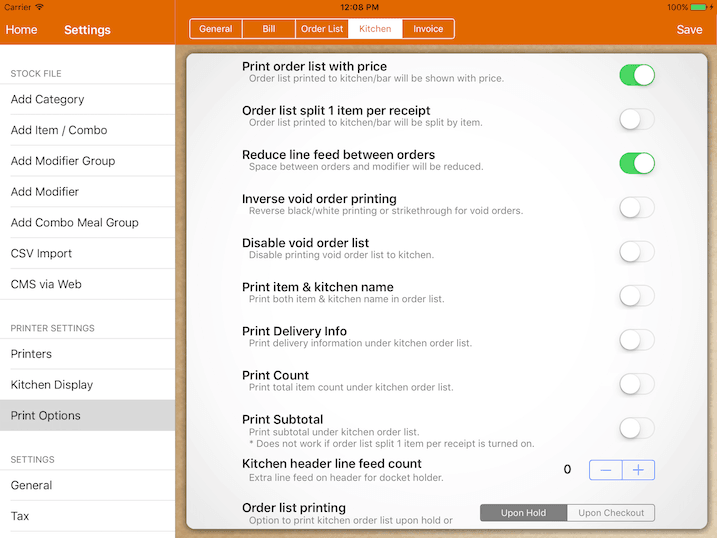 By turning on, it will print both item & kitchen name in kitchen order list. By default, orders will be printed to kitchen upon holding the bill. However for quick serve mode, this can be configured to upon checkout or payment received. Group identical category order together when printing to kitchen. Adjust the font size that is printed to the kitchen. Adjust table number font size that is printed to the kitchen. * Star TSP-100 printer supports only 2 font size.